For the past 18 months, SeaMicro, the upstart maker of microservers that are based on Intel's Atom processors, has heard from x86 competitors trying to keep it out of hyperscale data center server deals that the Atom cores are too wimpy to do heavy lifting workloads. But now, the SM10000 line of microservers – actually more like a supercomputer cluster of minimalist microservers – is getting the brawny cores in Intel's Xeon E3 family of server chips, closing the gap with x86 alternatives and removing a big barrier to adoption for its machines. 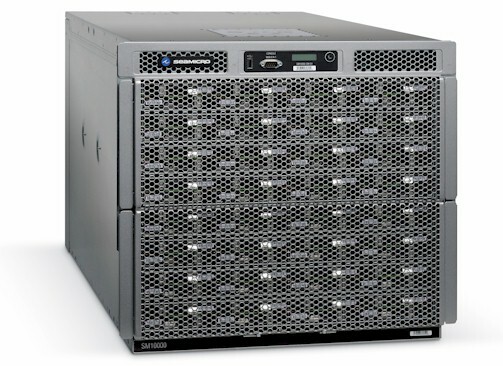 The new SM10000-EX line is based on the same basic chassis as the three prior generations of SeaMicro machines, which have a chassis that supports 64 processor cards with varying numbers of 32-bit or 64-bit Atom processors – and now 64-bit Xeon E3s – in a 10U chassis. Andrew Feldman, CEO of the server maker, tells El Reg that the new machine will burn half the power, offer three times the density, and provide twelve times the bandwidth of other "Sandy Bridge" class x86 server platforms. The SM10000-EX won't run just any old Xeon, or even any Xeon E3 model. "We looked long and hard for the right CPU to attack bigger workloads, and a 2.4GHz Sandy Bridge core is a brawny core," says Feldman. "It's a boulder crusher." And, Feldman adds, the E3-1260L is a low-voltage part in the E3 family, which means it is the most power efficient Xeon in that line, and the E3 has power efficiency advantages compared to the forthcoming Xeon E5 processors, due in the first quarter for two-socket servers, and the current Xeon E7 used in four-socket and eight-socket machines. While the Xeon E3 chips are limited to a single socket per server node, they don't have all the extra SMP and NUMA electronics needed to provide cache coherency across multiple sockets, which burns up juice. Jason Waxman, general manager of the the Cloud Computing Group at Intel, tells El Reg that a SeaMicro server node using the quad-core Xeon E3-1260L processors will have about twice the SPECint_rate2006 integer performance as cards with six dual-core Atom N570 processors and the related NM10 Express chipset used in the SM10000-64HD configuration announced last July. The Xeon cores, along with larger main memories per node, the extra integer oomph is exactly what hefty Java and PHP applications or even SQL database and NoSQL data store workloads require. Intel was not exactly thrilled about the prospect of companies deploying microservers using Atom processors, at least not initially, but it is coming around to the idea as companies like SeaMicro push it and in preparation for the onslaught of ARM-based servers, which will probably take off in earnest late this year and early next. "SeaMicro is pretty modest," says Waxman. "They were really the first company to push us hard on the Atom, and they are the first to develop a system that supports both Atom and Xeon." SeaMicro is eager to slide in future "Ivy Bridge" Xeons and future "Medfield" Atom system-on-chip designs (which are expected to come with tweaks specifically for servers) when they become available. "We're looking forward to cranking out 22 nanometer Xeons and that Atom SoC," says Waxman, without mentioning Advanced Micro Devices or the ARM collective, which is going to be gunning for both processors to try to steal away server, workstation, and PC business. In addition to supporting the Xeon E3 processors, the SM10000-EX line has some tweaks to the 3D torus interconnect that links server nodes in the chassis into a single, shared fabric that in turn links to virtualized disk I/O and virtualized external Gigabit or 10 Gigabit Ethernet network ports. The new iteration of the interconnect, code-named "Freedom", has a new feature called TIO, which is short for Turn It Off. What this feature does is simple, but very important in hyperscale data centers where power consumption is as big of a problem as paying for physical servers.